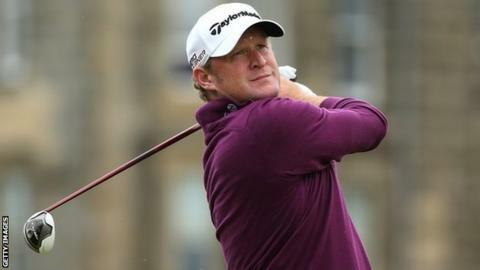 Jamie Donaldson is relieved to have ended his second round in The Open at St Andrews on one under par, enough to see him make the cut. The Championship will finish on Monday because of weather delays with the third round scheduled for Sunday. Donaldson was content with his second round display and he will tee off the delayed third round at 10:30 BST. "In the conditions, I'm pretty happy. I've pretty much had the rough end of the draw," he said. "It's been difficult for two days running. It's hard to make a score in that wind and I've just been battling for two days. "These things happen so you've just got to take the rough with the smooth." The United States' Dustin Johnson leads at the halfway stage after he carded a second-round, three-under-par 69 for 10 under overall and is one shot clear of England's Danny Willett (69). That leaves the Yorkshireman eight shots ahead of Donaldson, who missed the cut at the 2014 Open. "I think Danny Willett has been on my side of the draw and that's awesome scoring in those conditions," Donaldson told BBC Wales Sport. "If you're playing well enough, you can still make a really good score in tough conditions. "I just haven't quite been able to do that as of yet, but there's two days left to make an impact on my score."